Rotary Club of Matlock - Welcome! President Paul Edwards was in the chair, when the Rotary Club of Matlock, celebrated their 91st Birthday at Matlock Golf Club, on Monday 18th March 2019. Principal Guests on this occasion were Rotary District Governor Dr Cheryle Berry MBE, President of Matlock Inner Wheel Gill Oldroyd and guest speaker Dr Geoff Miller OBE. Cheryle Berry, Rotary District Governor, responded and reminded Rotarians of the part they could play in the International theme for the year to ‘Be the Inspiration’. In addition, she complimented the Matlock Club members on their programme of work over the last year and proposed a toast to their continued success. President Paul Edwards then responded, outlining, with justifiable pride and considerable humour, many of the noteworthy activities of the Matlock Club over the last year. He named some of the many beneficiaries and thanked his colleague Rotarians and the people of Matlock and district for their excellent support of the club and its projects. The formal dinner, organised by Past President John Shipman, was attended by 27 Matlock Rotarians and their guests plus representatives and guests of 17 other Rotary Clubs – a total attendance of 98. Geoff Miller, Gill Oldroyd, Cheryl Berry, Barbara Edwards, Paul Edwards. To mark the start of the ‘the Great British Spring Clean 2019’ Matlock Rotary club have been out in force in the community. Members of the public may have spotted members who have been out collecting litter from different areas of our community. The Club had two teams of collectors both of whom were able to find ‘loads of rubbish’ discarded by the public. One team concentrated on the many footpaths off Chesterfield Road and the other went further afield to clear Lant Lane and Allen Lane. ‘It was gratifying that various members of the public stopped and thanked us when they saw what we were doing’ said President Paul Edwards. The organisers, Simon Brister and Peter Wigglesworth had spent some time assessing which areas were most in need of a clean and settled on these two areas for the Club’s first ‘Litter Pick’ which is likely to become an annual part of the club’s community volunteer work. ‘It is extraordinary how many drivers must throw used bottles, cans, coffee cups etc., out of the car window once they are out of sight on quiet country lanes. On some sections we found large quantities of the same beer can suggesting the same culprit’ said Simon. Al. together members collected 18 large bags of rubbish. 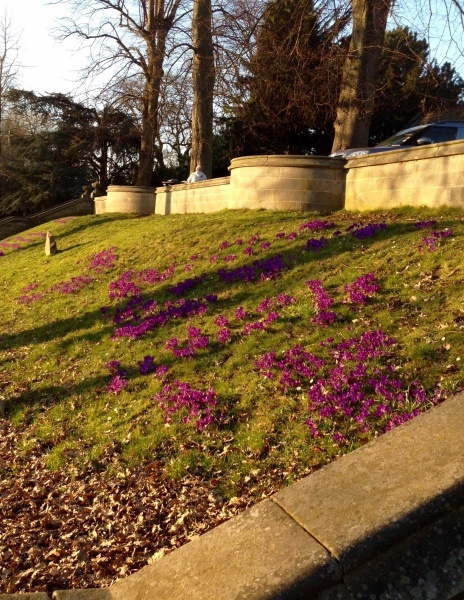 The club would like to thank Ros and her team at the District Council environment team for their help. friends and enjoy a variety of activities for free. board games and possibly gardening tools. Currently around 20 elderly people attend the group once a fortnight. The Limelight Friendship Group also works with Age UK. 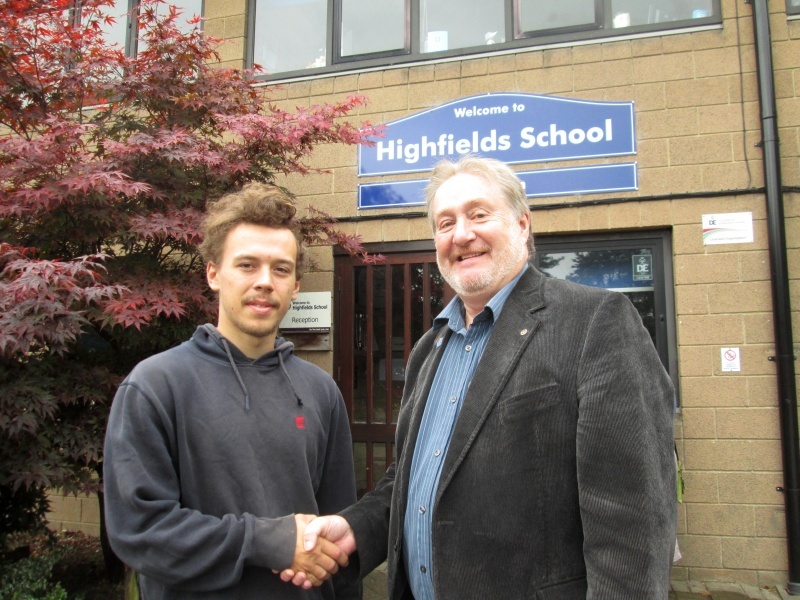 Matlock Rotary Club has recently approved four Community Grants to projects in the Matlock area. Bryn Apperley, the Vice-Chairman of Matlock Town Football Club, received a grant for his sterling efforts in organising a Christmas Day Dinner, for around 20-25 elderly people in the Matlock area, who would otherwise be spending Christmas alone. 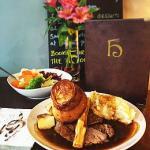 The three course meal will be provided on Christmas Day in the club lounge at Matlock Town Social Club. The Do Something Different Club, represented by Christine Smith, Sadie Packard and David Brown received a grant to cover the costs of funding drivers who provide transport for the club members. The Do Something Different Club is an out and about lunch club for those who are housebound in the Matlock area and has about 20 members. Drivers pick the club members up from home and take them back after their trip out. Darley Dale Primary School, represented by David Monkhouse and Michelle Waters, received a grant towards a defibrillator to be installed on the school’s outer boundary wall, enabling the community to also have access to it. This vital piece of equipment will save people’s lives who have suffered from a heart attack. Limelight Friendship Group is for the over 60s in the Matlock area and it provides refreshments and activities such as board games, crafts, indoor bowls and visiting speakers. The group aims to encourage lonely isolated older people to come out of their homes, to make friends and enjoy a variety of activities for free. The grant awarded by Matlock Rotary Club will enable the group to buy some exercise equipment and help with costs of running the club. A presentation evening was held at Matlock Town Social Club on December 13th, where cheques were handed over and the applicants had the opportunity to meet the President of Matlock Rotary Club and fellow Rotarians. A total of five Community Grants have been awarded this year and further applications are welcome. 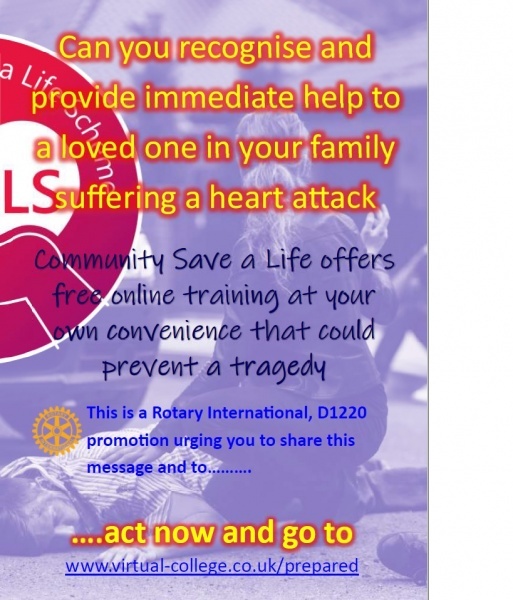 Please visit the Matlock Rotary Club web site for further details or contact Peter Wigglesworth on Matlock 56259. Matlock Rotary Club recently launched a Community Grant Scheme and is pleased to announce that the first Community Grant has been awarded to Starkholmes Village Hall. The Village Hall needed to replace its folding tables with a brand new set, including a trolley for moving them in and out of storage. A total of 14 tables were purchased and these will be used at events held at the Village Hall. Matlock Rotary Club was asked if it could provide funding through its Community Grant Scheme (see web site matlockrotary.com) and as the application met the grant criteria it was approved and the tables and trolley were purchased. Starkholmes Village Hall Committee thanked the Matlock Rotary Club for their grant at a recent visit by a Rotary Club member to see the tables and present a cheque for £725.60(grant and donation). Photo 2 Left to right Mark Wilson, Annette French, Denise Peck, David Peck, all from Starkholmes Village Hall, assemble the tables. This annual event took place on Sunday 5th August and despite temperatures of 27 degrees a great day was had by all without injury or loss of any competitors. 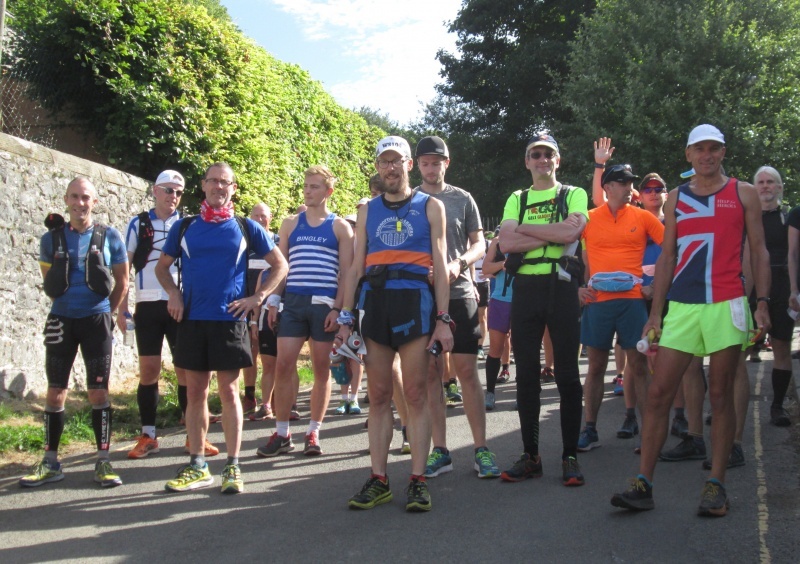 Good turn out from some running clubs - see below - so thanks for that - they helped make up a total of over 400 entries. Many thanks to all Rotarians and other helpers who made the day possible. We should have raised a goodly sum for the British Skin Cancer charity. 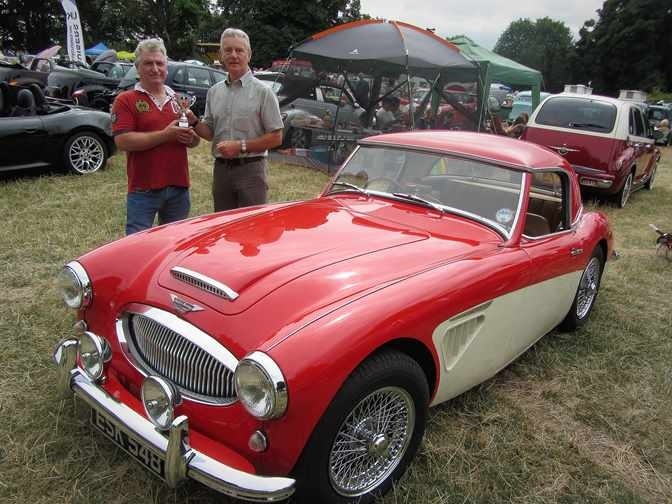 Best car at Ashover: Well done John Gregory of Kilburn, near Derby, awarded 'best car' at the 2018 Ashover Classic Car & Bike Show with his 1962 Austin Healey 3000. Trophy presented by Chesterfield Scarsdale Rotary president Ron Enock. 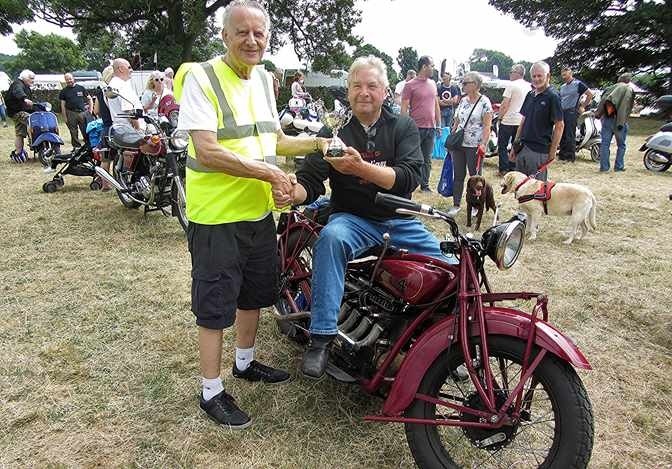 Best bike at Ashover: Congratulations to Jess Bamford of Codnor who won 'best bike' at the 2018 Ashover Classic Car & Bike Show with his very rare 1929 Indian 4 1260cc American motor bike. Trophy presented by Chesterfield Rotary president Barry Thompson. There is a video of the presentations on facebook. Paul Edwards, former Ofsted Inspector, police officer and ex-headteacher of Wirksworth Junior School, is the new President of Matlock Rotary Club for the 2018-2019 Rotary Year. Paul was installed as President at the Club Meeting on Monday 2nd July held at The Remarkable Hare in Matlock. Enhance links with local schools and other organisations. The 35strong Matlock Rotary Club meet on Monday evenings at the Remarkable Hare, Dale Road, Matlock and are always looking to meet people who might be interested in helping out occasionally at events or becoming a Club member – just Google Matlock Rotary Club for details. Other officers for the new Rotary year, are President Elect Phil Pegg and Vice President, Tom Moloney. 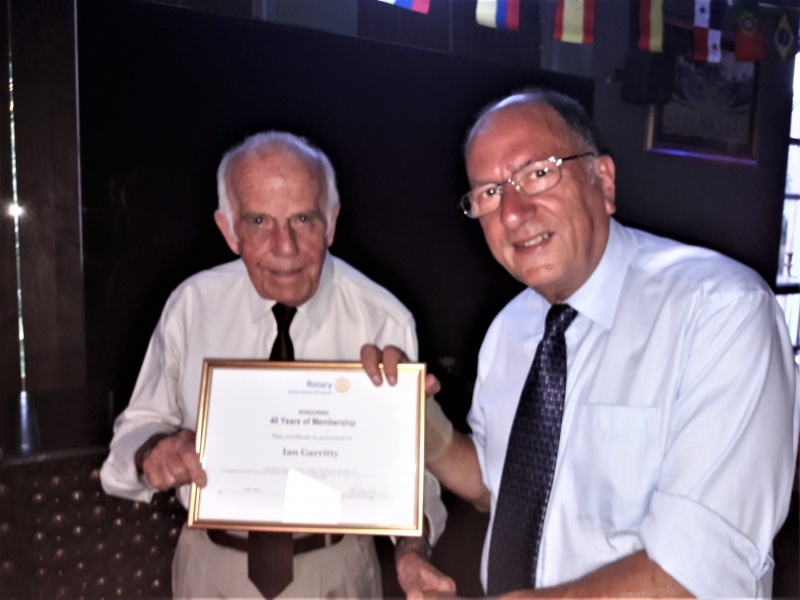 Ian Garritty, of Megdale, Matlock has received an award from Matlock Rotary Club for being a member of the club for an amazing 40 years. Ian joined Matlock Rotary Club in 1978 when Matlock was a centre for textile manufacturing and limestone quarrying, beer was 43p a pint and petrol cost 76.5p a gallon. Ian has attended the club regularly over his 40 years of membership and was President of the club in 1992. Four years ago, Matlock Rotary Club and Matlock Rugby Club took a punt at organising a classic car and bike show, not knowing whether it would be a success. It has now grown into an established show and attracts visitors and exhibitors from far and wide. This year’s show, held on June 17th, at Cromford Meadows, drew in over 200 classic cars and around 20 classic motorbikes. Visitor numbers were over two thousand and everyone had a great time. A lovely carnival atmosphere was provided by Ashover Band playing popular brass band music. 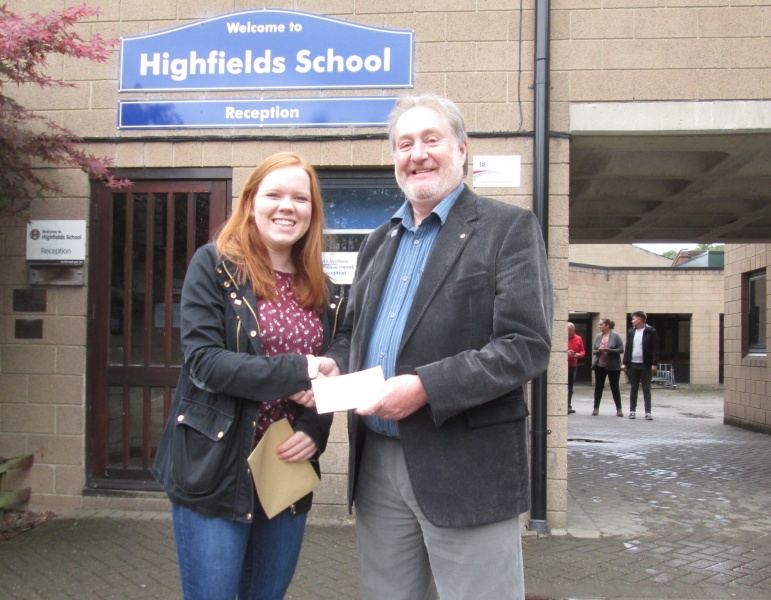 The funds raised by the show go towards developing the facilities at Matlock Rugby Club and funding Rotary projects in the community, such as the Highfields School Bursary Award, or helping charities and good causes. The best car in the show was awarded to Dave Bull of Chesterfield, the proud owner of an immaculate 1949 Buick Dyna Flow. The best motorbike in the show was awarded to Jon Lambley, of Matlock, who owns a beautifully restored 1949 Vincent Series B Rapide.